Yesterday’s chemistry exam was a lot less stressful than the others – most likely because it was written. There is so much less pressure when it is a written exam! You have time to really think things through and no one is sitting there awaiting an answer. The exam was split into two parts. The first included 10 structures and 5 calculations. I memorized all of the organic structures for the exam, but only briefly reviewed the inorganic ones (since I memorized them when I took chemistry in college in Santa Monica). I was able to answer all but one on my exam – orthophosphoric acid. I felt like an idiot when I got home and looked it up because that is just another name for phosphoric acid – which I couldn’t forget the structure for even if I wanted to. I think we’ve mentioned phosphoric acid at least 50 times throughout the semester. You’ve won this round, H3PO4! As for the calculations, I was able to finish 3 of them with complete confidence. Luckily enough, I had done eerily similar ones to those in my cramming review session before the exam. For the other two I was able to list the equations and steps to complete the problems, but could not figure out how to actually do them in the few minutes I had left. After we turned in the calculations sheet, it was time for multiple choice. There were few that I felt confident about. Some were taken from the review questions handed out to those students who had applied for exemption earlier in the semester – and luckily enough I got a copy of this from Charlotte. There were maybe 4-5 that I had to completely guess on – and I mean completely, as in “hmmm…B…for Bianca…and….D…because I haven’t done a D in a while”. For the others, I was able to make a more-or-less educated guess. The third part of the exam was the lab portion, which was really just a retake for those that didn’t pass their lab exams during the last week of school. Since I had passed my lab exam, I waited outside until 1:00 p.m. when the exams were done being graded. Once the doors opened to the lecture hall, we all filed in and headed down to the front of the room where our index books were spread along the front desk. Everyone groaned as soon as they found theirs – no one wants to stress about having to take an exam over again. I passed my exam, doing better surprisingly on the multiple choice than I did on the structures/calculations (curse you, H3PO4!). In hindsight, I should have asked to see my exam, just to see what I had missed points on, but as soon as I knew I’d passed – I was done. After my attempt at taking a nap when I got home yesterday (I’m horrible at relaxing), I decided to fit in a little yoga session. 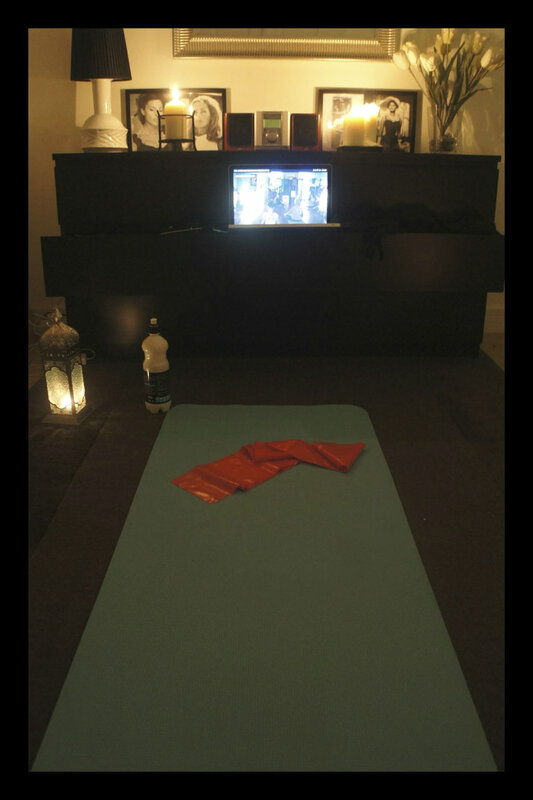 I set up everything in the bedroom, lit some candles, and found a full vinyasa yoga class online. I tried to take a picture but it’s a really awkward space, so this is the best I could do. Alright, enough break, back to statistics!! So annoying with the phosphoric acid! They are photos from my old make-up area in Oslo 🙂 It’s Monica Belluci, Ursula Andress, Sophia Loren and a Swedish model Line Gost in a photo shoot inspired by Sophia Loren. I love that look! You are currently reading Chemistry Exam and Yoga at Buda-B.